Nigel Farage Launches His Personal NO Campaign As The Question Changes! 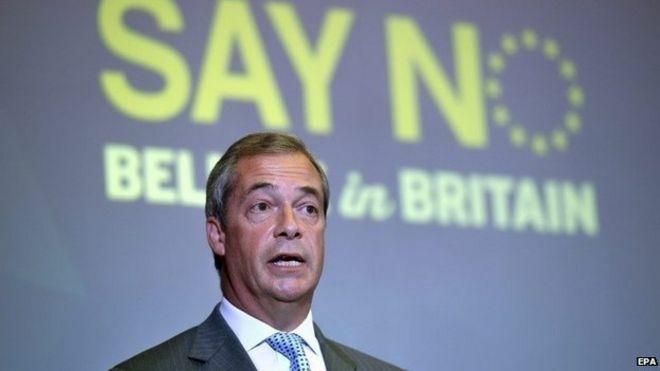 Announcing The Fact That Nigel Farage is launching his personal NO Campaign on the very day it was made public that YES or NO was not to be the question, in the EU Referendum, speaks volumes! In my opinion as Nigel Farage & his politically inept Ukip fan club are likely to do more harm than good for the Leave_The_EU Campaign – due in part to the fact that they are, like Marmite, popular amongst a disorganised minority whilst clearly revieled by the majority. Not only this but they seek to found their arguments on racism and a clear misunderstanding of the meaning of immigrant, refugee and borders in the modern world – well presented facts and logic with a well laid out plan for HOW we Leave_The_EU and our detailed plans thereafter could win the vote for the Leave_The_EU campaign but not shoddy populism – just as almost 4Million votes for Ukip utterly failed to deliver a corresponding scale of MPs due to disorganised and badly planned populism based on the drive for power of one man’s ego. Nigel Farage’s incompetent self serving ego is much more likely to undermine the Leave_The_EU lobby than deliver a positive vote to Leave_The_EU – the EU must be laughing whilst we weep at the realisation that Britain and its peoples will be the loser just as when the NO Campaign failed to deliver a NO vote in the last UK EU Referendum due to squabbling and incompetent leade rship of a fractured campaign. I do not for a moment believe that Nigel Farage is the only individual working for his own personal gain at the expense of Britain as the likes of Matthew Elliott, Dominic Cummins and a raft of self serving Politicos feeding from the EU’s toxic anti British anti independence teat are doing so as well – the likes of Peter Mandelson, Michael Hesseltine, Neil Kinnock and the war criminals & liars Tony Blair, Jack Straw and their duplicitous clique. The EU will pour £Billions into their aim to win the Referendum regardless of David Cameron’s brief period of ‘Purdah’, they will try to hide it by using the blackmail of EU pensions as paid to literally 100s of politicians and Civil Serrvants and the funding from OUR taxes of Erasmus Lecturers and Grants to students paid for by British taxes but claimed to be paid by the EU – not to mention massive soft loan running to many £Millions a year paid to buy a pro EU bias from organisations like the BBC and journalists right across the media. You may have even noticed that even Andrew Edwards, the sometime BNP supporter, has voiced his concerns based upon his suspicions of Nigel Farage – suspisions that come in numerous forms right across the public spectrum – suspicions that have ensured Ukip’s failure in domestic elections and his own failure to get elected, despite standing for parliament with all the credibility of David Such’s Monster Raving Loonies Party on 8 occasions! 3. Farage is but a puppet of quislings and their controllers: That he would help to split the ‘No’ campaign, and thereby dilute its effectiveness was a foregone conclusion! 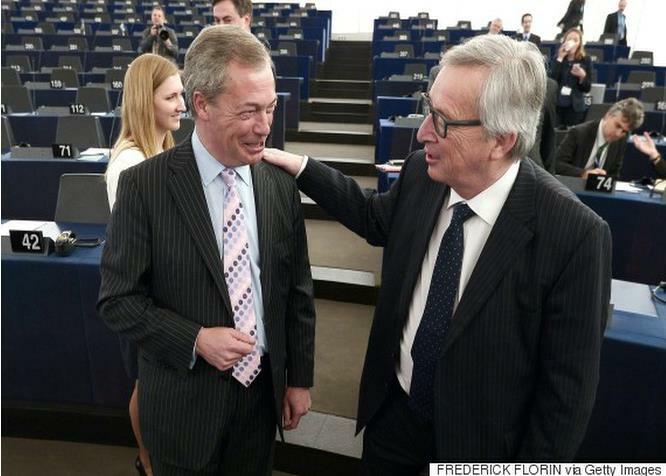 You can see that Farage really loathes Jean-Claude Juncker can’t you? The UK Independence Party says it will launch its own campaign against staying in the EU instead of joining one of the two existing No campaigns. Leader Nigel Farage believes UKIP can mobilise thousands of supporters of exiting the EU at public meetings. UKIP, he said, had a “unique role” to play and wanted to “get cracking”. The decision highlights splits that emerged after the general election when some in his own party said he was too divisive to lead the No campaign. 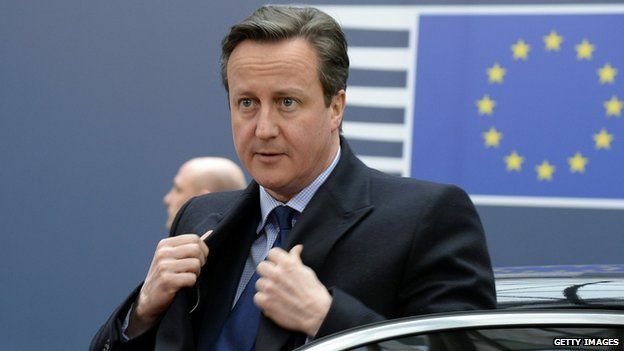 There will be only one official No campaign for the UK’s referendum, with two groups currently vying for the role. The Electoral Commission has yet to decide which group to designate as the official No campaign for the referendum, which is set to be held by the end of 2017 on whether the UK should stay in or leave the EU. Designation brings with it the benefits of higher spending limits, television broadcasts and a grant. Mr Farage told the BBC that he was not seeking to lead the official No campaign and that UKIP – which will launch its own campaign on Friday – would work alongside whichever “umbrella” group was chosen as well as Eurosceptics in other parties. Mr Farage suggested UKIP’s performance in the 2014 European elections, when it topped the polls in the UK, showed it could deliver nearly two thirds of the votes needed to win a referendum on EU membership. Nigel Farage believes UKIP has the structure in place to mobilise thousands of activists that could prove invaluable to any No campaign, placing his party is at the heart of the effort. Mr Farage also thinks the other No camps lack his combination of political nous and reach outside of Westminster. Nonetheless he paints a picture of harmony on the No side. He says he speaks to senior figures in the other camps several times a week. He is also inviting them to UKIP’s conference in Doncaster at the end of September. He wants to see them up on the stage addressing his faithful. What of the Yes camp? Easyjet chief executive Carolyn McCall is the person being eyed up to front the campaign. Behind the scenes, early funding is coming from Lord Sainsbury and there is already a cross-party consensus in place with Peter Mandelson, Danny Alexander and Damian Green the self-appointed political figures. Strategy is quite advanced. University students arriving for the start of term are likely to face a concerted effort from a Yes campaign that wants to take advantage of political activists already in place on campuses across the country. There are some fears though of splits that could prove problematic. With David Cameron still yet to finish his tour of European capitals and complete his pre-vote reform negotiations, there is a group of Tory MPs who are in the “Yes but…” camp. They want to see what he gets. There is a concern that could lead to a rival campaign, or a campaign within a campaign, that would be “Yes lite”. But the decision risks muddying the water on the No side, with effectively three rival campaigns in existence – the Business for Britain group featuring well-known Westminster figures, UKIP donor Aaron Banks’ group The Know.eu, as well as UKIP. Mr Farage said he hoped the two other groups would come together to fight the No campaign as one, which he suggested could be fronted by a non-politician, such as someone from the worlds of business and entertainment. He also said figures within his own party, such as deputy chair Suzanne Evans, were wrong to suggest that immigration would not be a central issue in the referendum. Next Next post: GP-RN: Leave or NO, YES or Remain – That Is The Question!